We’d love your help. 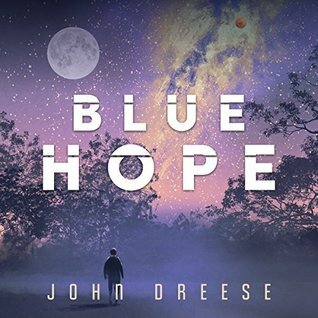 Let us know what’s wrong with this preview of Blue Hope by John Dreese. Four brave astronauts left home to be the first humans on Mars. What didn't come back will haunt life on Earth forever. Follow the adventure as disaster triggers the greatest treasure hunt in history - spanning the globe and beyond. The prize is nothing short of humanity's very survival. To ask other readers questions about Blue Hope, please sign up. MORE!!! I need more HOPE! Love this two book series and highly recommend reading them! My only complaint is I want more! It's more than a sci-fi series, it's a heart felt story of our humanity! Really enjoyed both books. Although this was meant as the end, I can see a possible third book. Still more story to tell! TRULY this is one of the best series I have read in the past 5 years. ADAM the main character is a very well written character and this story picks up where the last book left off. If you enjoed The Martian or Red Planet you will love this book. This book is as good as The Martian. I can see this easily being adapted for a motion picture. A SYFY channel movie would not do it justice. The plot flows just right with no lags in it at all. The plot also is not too far fetched. I A new favorite book. Best science fiction I have read in ages. Both original and believable! Thank you Mr. Dreese. You have reinspired my interest in the genre. Hope the next book is in the works. I look forward to enjoying your imagination in the future. Thrilling! Exciting! Perfect ending for book two. I liked that this book didn't stray from the small amount of characters, it had the right amount of characters . Note, that I occasionally highlight any questionable editing that I see when I read books. I'm not an editor, but I know when something looks funky. I enjoyed this book and finished it in 2 days. Loved following the characters, and seeing how they change (not giving any spoilers). Felt like a wild adventure ride for the second half of the book - which was fun. I should have known what I was getting into from reading Red Hope but this was twice as long and twice as poorly written. Again, I give Dreese credit for following his vision and writing two books that, at the very least, move along fairly quickly. His love of writing and of his story really does shine through on the pages. But this book really needed an editor. It's way too long with unnecessary information and the dialogue is so awful. Did he read other books to see how conversations are written? Instead we get stilted, cringe-worthy, lines that no one actually talks like. We also get a lot of unnecessary details like when a character goes to the doctor, the nurses take blood samples, urine samples, and a pregnancy test "just to be certain." Then another few sentences on why they had to do a pregnancy test (it's procedure, it's standard etc.) In real life, I am sure they do that, but it's inconsequential to the story or the scene so what's the point? Just say "the usual pre-screen" or "prepped her for surgery". We don't need every step in the process. He details every movement [general example:] "he put the car in park. Opened the door. Got out. Closed the door. Walked twenty steps to the intersection. Made a left. Walked down the block. Made another left. And entered the bank lobby." Just say "He made his way to the bank" the reader can imagine the rest. The entire book is filled with this unnecessary and nonsensical details. Also, anytime someone is on the phone the person on the other end of the line says "Hang on" then covers the phone to ask somebody nearby a question. Why? We never find out what the questions are so what's the point of writing that? And it's in there several times. Characters are constantly "laughing to themselves" or "rolling their eyes". There is even an entire chapter dedicated to a discussion about vending machines and three separate instances on how to make a major purchase (two cars and a house - each of which are detailed incorrectly.) Why? To what end?! This story, like Red Hope, takes place in a world where every single person is a complete idiot. From the President on down to the gas station attendant. I don't just mean they act stupid, I mean the entire book relies on every person doing and saying the dumbest thing at the right time in order to propel the story. I also have to complain about this: (view spoiler)[ NASA initially believes that the Martian lab is located at the bottom of the sea off of Fiji. Before they go on the expedition, Adam gets info from some dumb character that makes no sense that NASA is going to the wrong place. It's very flimsy info but within the context of the story we know that it's accurate. Adam then goes to NASA, tells the director that he has information that the lab is actually somewhere else and the director waves him off saying "let's discuss it when I get back" from the bottom of the ocean where the martian lab isn't?! Then Adam agrees and says to himself, "I probably should have made more of an effort to tell her that is the wrong location. Oh well." OH WELL?! It's not like she is going to the wrong Starbucks, she and a team of people are diving to the second deepest trench on an very dangerous and expensive mission and he knows the right location! It's so dumb! (hide spoiler)] If Dreese wanted that to occur because of a result (which I won't spoil) then just have Adam find out the information after it's too late. Not before when he can very easily do something about it. Read both books back to back. Could not stop. Mr. Dreese is going to go far. And I will read anything he comes up with in the future. Imagine a ten star rating instead of just five. I recommend both books highly. An excellent follow up to Book one! Do you enjoy thrillers? Like suspense? Vivid scenes and action? How about fascinating ideas and great execution of it all? Well, I believe you best read Red Hope and Blue Hope! Terrifically entertaining! 4.5 stars...I hope there's going to be another book to this series! Five Star for first series! Absolutely fascinating! It is a totally believable story that I couldn't put down until I finished it. Hard to believe he is a new author. I loved these books!! I couldn’t put down Blue Hope; I had to know what happened. Truly glad Dreese decided to make this a 2 part story - I anxiously await his next wonderful story! Great read. Even better than the first book. Looking forward to another book by John Dreese. An extremely complex series of events in the life of the central character Capt. Adam Alston was brilliant ly pieced together in a long, linear chain which made this tale extremely readable and almost impossible to put down. A stand alone story not requiring the reading of "Red Hope" but it wouldn't hurt the understanding of this story. What a wild ride! Sure, I had to suspend disbelief in places, but it was still exciting. I got pretty aggravated at Adam for a while, but he mostly redeemed himself. Too bad Chris comes a close second to the President Jennings as an awful person. And now I'm SO HUNGRY for some ice cream. This book was such a disappointment & a waist of a full audio-book price! I did not buy it to know about the Earth bound shenanigans, I have had no connection to them in book 1, I was there to hear about the characters from the Mars mission! Really pissed off angry at the moment. A total an utter let down! While my objections to the first volume still apply (somewhat artificial characters and choices), the fresh, clean writing style, nicely done SF, and a more entertaining story result in a better sequel than the original. Enough of an improvement over the first volume to get 3.5 > 4 stars on GR. I wish goodreads had a DNF option. I struggled through book one even though it was pretty clunky. I thought there was enough intrigue to justify reading book two, but it is terrible. The author does a great Jon of building out the world from the first book. I was skeptical of where the plot would go and it ended up being great. I enjoyed red hope and was pleased the follow on was just as good .I recommend it.more please john!!! Amazing! Excellent sequel, which also works as a standalone novel, with unexpected twists and the storyline rarely slows down. Without giving too much away what was found on Mars in Red Hope has given mankind hope of a better future. Are we descended from Martians? Read it and find out. I couldn’t put this down after I was through the first third of the book. Really good job at pacing events out. Cliffhangers galore! Hoping for a "moon expedition" book 3. How can there not be? Excellent story and the characters were well defined. Excellent finish to the two book series. Good character development, a plot with twists and turns. This novel was hard to put down. Great second part in the Red Hope series. The book starts off with a short recap of what happened in Red Hope with a little extra stuff added in and then Blue Hope takes off and doesn't stop or slow until the very end. Blue Hope is twice as long as Red Hope is and wraps the storey up very nice.